3D printers shape food in Google's kitchens allowing Chef Bernard Faucher to design creative and customizable food for Googlers. The machine prints objects in three dimensions. Typically, people use concrete or plastic. Faucher uses pasta dough or shells. Technology enables him to define time and temperature as it relates to cooking meats, vegetables and other food. About 75% of the ingredients used in the kitchen grow locally. 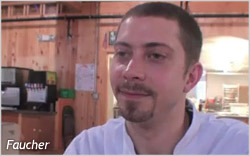 Aside from working at Google, the technology savvy chef runs the kitchen at Dance New England. A similar type of printing, -- bio-printing, developed by Modern Meadow -- has also caught the eye of Peter Thiel. The PayPal co-founder recently backed a company producing 3D printed meat. The Thiel Foundation will donate $350,000 to the startup making bio-printed meat to satisfy a "natural human craving for animal protein," according to CNET. Cool technology -- but a bit scary. Law enforcement now warns of terrorists and "gangsters" having the ability to make workable bombs and guns wherever and whenever. A Wisconsin engineer demonstrates the ease of using a Stratasys 3D printing machine and blueprints downloaded from the Internet. Wired points to a blog post describing how he printed and built a usable frame for an AR15 rifle and turned it into a gun. For those who need to transport the 3D printer, no problem. Two Massachusetts Institute of Technology (MIT) students have designed one that fits in a small suitcase. Ilan Moyer and Nadya Peek developed the PopFab as a machine that could do all 3D editing. It folds out and a printing head attaches to the arm. Apparently, the creators have been traveling with the printer on board flights within the U.S., Saudi Arabia, and Germany. PopFab shows us how it works.